The challenge of securing the southern U.S. border is changing dramatically as fewer Mexicans cross illegally, but more Central Americans arrive seeking refuge from the terror and chaos of their home countries. SAN SALVADOR — Last spring, Maria del Transito had five adult sons. Four have since been killed. They died two at a time, three days apart, shot execution style in this small Central American nation that has been plunged into bloody chaos by warring gangs. Gustavo is the only one left. At last word, the 24-year-old was trying again to reach safety in Houston. Araceli Amaya, 25, has also tried to flee this country's gang violence after seeing her brother killed "right in front of us." Caught traveling through Mexico and sent back home, she says she will almost certainly try again to reach the United States. Geremias Gomez, 28, is in the same situation: on the run from gangs in his native El Salvador, he was caught in Mexico on his way to the United States. He has every intention of heading back north at the first opportunity. "I would rather leave alive than wait until they bury me," Gomez said. "It’s hard to leave your family. But I can’t risk my life either." It's a calculation thousands of Central Americans are making each month, and their collective flight has fundamentally changed the nature of illegal immigration over the southern border of the United States. For decades, the majority of those crossing illegally were Mexicans compelled north by economic need, but experts recently determined that more Mexicans now are leaving the United States than entering. Migration from three small but violent and impoverished countries in Central America, however, has exploded. So great was the exodus two years ago from the “Northern Triangle” of Guatemala, Honduras and El Salvador that in 2014, for the first time since records have been kept, more non-Mexicans than Mexicans were apprehended by the U.S. Border Patrol. That will almost certainly happen again in 2016, the latest figures indicate. The policy implications for the United States and Texas are not trivial. Border control strategies — and political rhetoric — aimed at curtailing Mexican economic immigrants may be little match for the desperation of Central Americans fleeing abject poverty and gang violence — or outright running for their lives. 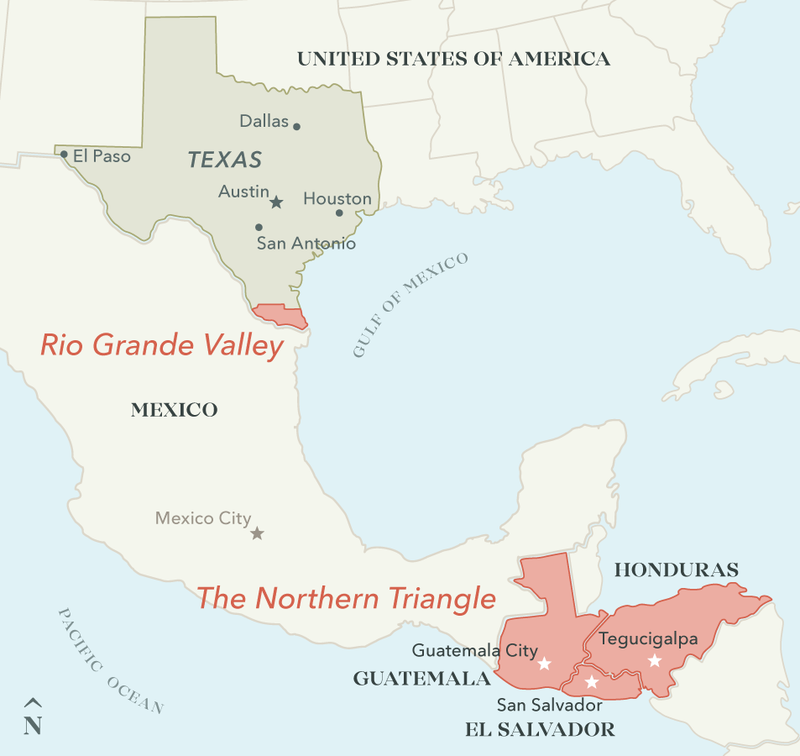 Geography and tradition make South Texas the closest and most common point of illegal entry from Central America. From the start of the 2014 fiscal year through August 2016, more than half a million migrants from the Northern Triangle were apprehended at the U.S.-Mexico border — at least 85 percent of them in Texas, apprehension data analyzed by The Texas Tribune shows. Most of them have not been deported and are presumably still here, experts say. These travelers present new and varied challenges for law enforcement, overwhelmed immigration courts, educators and social service providers. Among them are thousands of minor children and whole families who, rather than trying to sneak into the country undetected, willingly turn themselves in to the first uniformed person they encounter. According to a Tribune analysis of border apprehension figures, the three Northern Triangle countries — which have consistently registered some of the highest murder rates in the world over the past several years — have sent more people per capita into the arms of the U.S. Border Patrol than any other countries in Latin America in the first 11 months of the 2016 fiscal year. For a lot of these new immigrants, virtually no amount of border security — that political buzz phrase resonating from Main Street to the nation’s capital — will keep them from trying to get to the United States. They are simply too desperate. 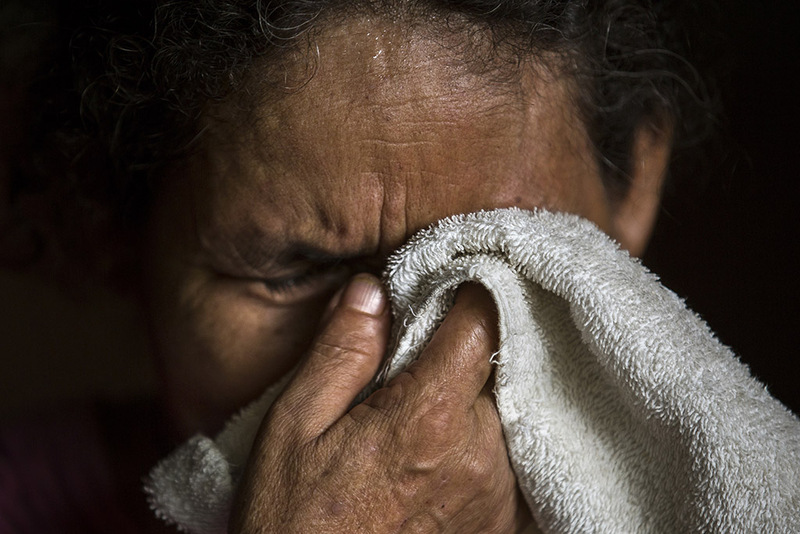 Maria Del Transito's last living adult son, Gustavo, had already been caught and deported from Mexico once when the Tribune caught up with her in El Salvador. The one-year anniversaries of her other sons' murders were just a few days away. The interview took place in May beside a highway in Usulután, about an hour and a half southeast of San Salvador, a rural region where cows crossing the road sometimes hold up traffic. She was too afraid to be seen with outsiders in or near her village, now in the grip of the feared MS-13 gang, so speaking to her in the back of a rental car was deemed the safest option. The tragedy for her family began in 2015, she said, when Gustavo saw a presumed gang hit while out fishing. She believes he was the real target of the maras looking to eliminate a witness and that his brothers were just collateral damage. Two — Edgar de Jesus, 17, and Jose Fernando, 26 — were shot on May 13 last year. Right after she buried them, two more — Francisco Javier, 32, and Juan Angel, 28 — were shot on May 16. “Now they say just seeing something is all it takes,” she said. “They get rid of the evidence.” Her voice barely exceeded a whisper and she seemed to choose her words carefully. Her eyes were red and misty. Sometimes her lips quivered when she spoke. Afterward, Del Transito began trying to help Gustavo get out of the country — to Houston, where he has friends. She mortgaged her house to help raise $5,500 to hire a smuggler. In the back of a red Kia Rio, she clutched photos of her dead sons. They’re literally dead — the pictures are of their bodies — save for one picture of the 17-year-old when he was alive. “Some days, I just don’t want to get up,” she said. This summer, about three months after the interview, word came that Gustavo didn’t make it to Texas — that he was deported a second time. After resting up a few days he headed back north to try again, his mother said. 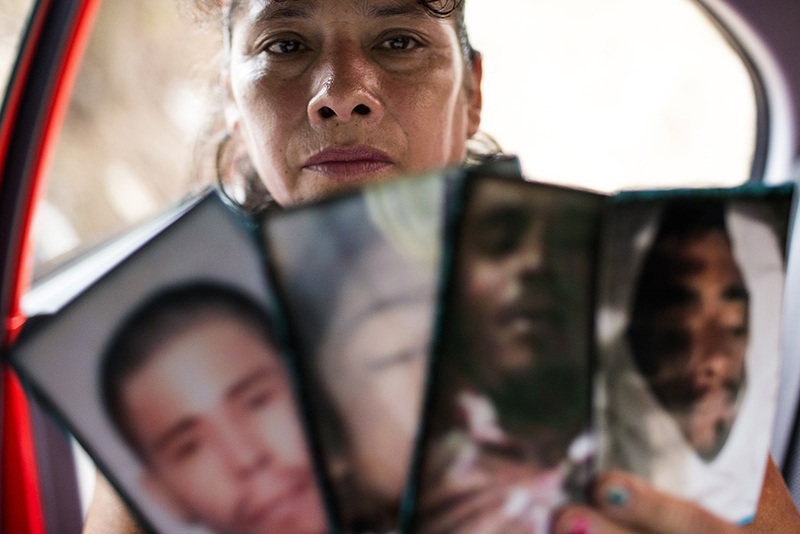 Del Transito is far from alone, trying to save her son as violence inflicted by rival gangs has earned El Salvador the appellation murder capital of the world. This spring, the Tribune interviewed dozens of U.S.-bound Central American migrants, from inner city San Salvador to the Mexican state of Oaxaca. Many provided tales of horrific encounters with gangs. Others spoke of crippling poverty. While the number of migrants from murderous El Salvador has recently eclipsed those fleeing Hondurans and Guatemala, conditions are similar in all three countries. On top of gang violence, there is staggering income inequality, high youth unemployment and low high school graduation rates, particularly in heavily indigenous Guatemala. 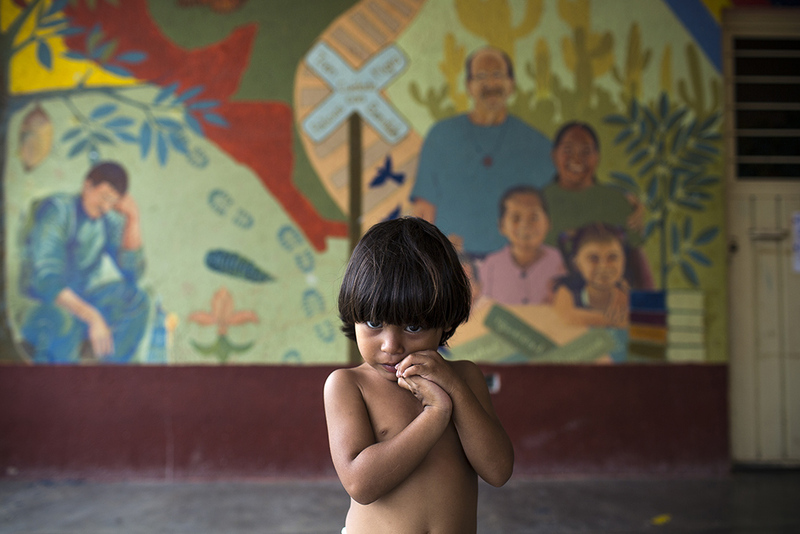 About 60 percent of the people in Honduras and Guatemala live in poverty. By the time Northern Triangle migrants cross one of the countless informal crossing points on the Suchiate River dividing Guatemala and Mexico, about 1,200 miles south of Brownsville, Texas, many have already traveled a few hundred miles. Experts say a majority of them attempt to reach the United States in the company of coyotes, or smugglers, after handing over $6,000 to $9,000 for the trek. Those who can't afford a smuggler bounce from shelter to shelter across Mexico, headed for the U.S. border, making what could be life-and-death decisions and often traveling through sweltering heat and stifling humidity. At a shelter in Ixtepec, Oaxaca, 28-year-old sawmill worker Alvin Jimenez of San Salvador said a gang member threatened him earlier this year for supposedly entering the wrong territory. “They asked me for money, and since I didn’t have any this guy pulled out a gun, but thanks to God it jammed,” he said. “It didn’t fire.” Jimenez was looking to migrate either to Los Angeles or Houston, first to send money back home and then, he hopes, to have his wife and two kids join him. The gang violence Jimenez and others are fleeing has strong roots — and thousands of members — in the United States, with Houston considered a significant hub. The Barrio 18, or 18th Street gang, for example, was formed decades ago near 18th Street and Union Avenue in Los Angeles. The most feared and famous gang is the Mara Salvatrucha (MS-13), started in Los Angeles in the 1980s by Salvadoran civil war refugees and their children. The gang soon spread to its ancestral homeland, a trend that vastly accelerated following a wave of deportations from the United States in the late 1990s. The word mara means “gang” in Central American Spanish, and Salvatrucha is commonly interpreted to mean “clever” or “street-smart” Salvadorans. The 13 represents M, the 13th letter of the alphabet. The gang has traditionally made its money from street drug sales and widespread extortion of businesses, known here as "la renta" (the rent). "Whether its a big company or somebody who sells tortillas or mangos, they pay this famous 'renta,'" said a Salvadoran police officer who requested anonymity for fear of being targeted by gangs even though he lives in Austin now. "They make people believe that they are going to take care of them and they pressure people who don't pay the rent." The MS-13 is known for its brutality and penchant for using machetes to hack people to death. In one 2003 case in El Salvador, prosecutors said MS-13 gang members decapitated two women they suspected of being police snitches and played soccer with their severed heads, according to local press reports. MS-13 members have brought that brutality to Texas and beyond. Their members have been tied to some spectacularly grisly slayings in and around Houston — two involving machetes — and on the East Coast. In one of the Houston-area cases, MS-13 members allegedly murdered and mutilated a 16-year-old Klein Forest High School student on the orders of gang leaders back in El Salvador, the Houston Chronicle reported. There are no good numbers on how many MS-13 gangbangers might be sprinkled among the flows of Central American migrants crossing the Mexican border into Texas, but they’ve been known to take the same routes. In July 2014, the Border Patrol caught a suspected MS-13 gang member, wanted for murder in El Salvador, near Donna, Texas, in the Rio Grande Valley. A year later, another Salvadoran MS-13 member, only 18 years old but identified by federal authorities as a “gang leader” wanted on murder and kidnapping charges back home, was caught in Hebbronville, in Jim Hogg County, part of the Border Patrol’s Laredo Sector. Ironically, some of the young Salvadorans running away from gang violence at home encounter it again in their U.S. host communities, particularly in pockets of the country with high concentrations of Central American immigrants. In a sweeping indictment of 56 MS-13 members in the Boston area earlier this year, the U.S. Attorney's office said the gangs "actively recruited prospective members, known as 'paros,' inside local high schools from communities with significant immigrant populations from Central America." "They started killing kids,” said one Salvadoran teen who had to abandon his local high school, according to a Boston Globe story published a few days after the indictments were announced. "I came from El Salvador from the same problems, and I’m fleeing from the same problems." Closer to home, the spread of MS-13’s unique brand of violence has alarmed Texas law enforcement. Citing the recent migrant trends, the Texas Department of Public Safety last year upgraded the gang to its highest “Tier 1” gang status despite the group’s relatively small footprint (an estimated 800 members) in a Texas gang population authorities say sits at roughly 100,000. “The influx of illegal alien gang members crossing the border into Texas in 2014, along with reports of extremely violent murders committed by its members in the Houston area, positions the [MS-13] gang as one of the most significant gang threats in the state for this upcoming year,” the DPS wrote in its 2015 gang threat assessment. 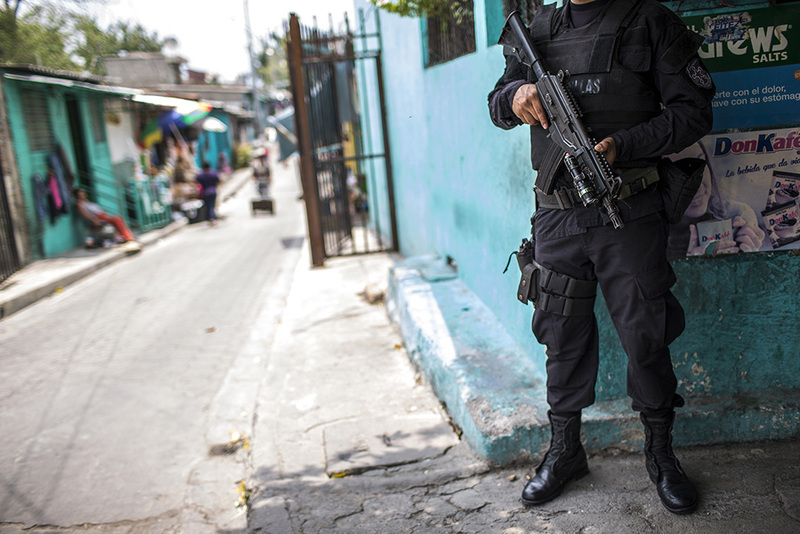 In El Salvador, dealing with the gangs has consumed the political dialogue and remains a focus of U.S. diplomacy and foreign assistance efforts in the region. Since the street violence metastasized here after a wave of deportations from the United States following 1996 immigration reforms under President Bill Clinton, the Salvadoran law enforcement response has lurched from merciless “mano dura” (iron fist) policies to a controversial “truce” secretly negotiated in 2012 between the government and gang leaders. The deal fell apart in 2014, and the former president whose administration is said to have forged it, Mauricio Funes, was granted asylum in Nicaragua a few weeks ago amid official scrutiny of the truce and an inquiry into allegations of corruption and illegal enrichment. A huge spike in murders followed the breakdown of the truce, and the country has gone back to the iron-fisted approach. In April the government, unveiling a series of “extraordinary measures” to combat the wave of violence, dispatched 1,000 soldiers and policemen into gang-held territories. Authorities have said the effort is bringing down the murder rate from the highs of last year, though it’s not clear what caused the springtime drop or how long it will last. 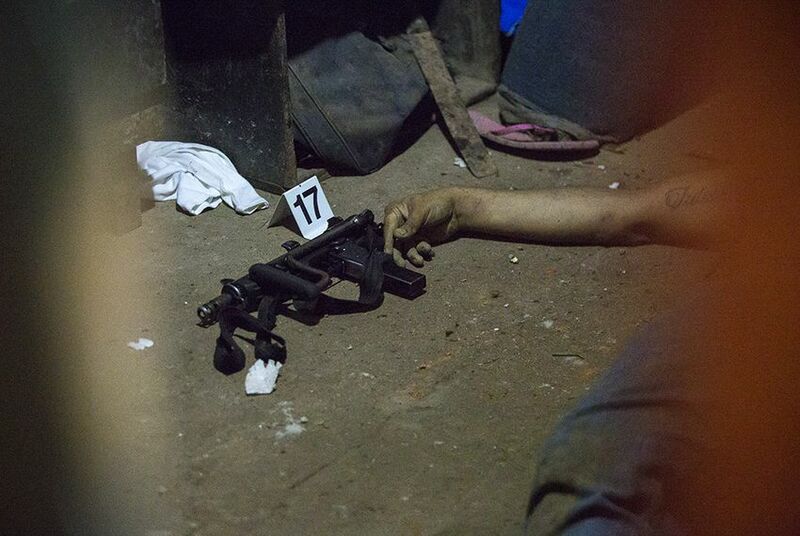 In the meantime, there have also been recent reports (by respected InSight Crime and others) of secret death squads allegedly involved in “extrajudicial” killings of suspected gang members. At the helm of the current law enforcement crackdown is Howard Cotto, a former guerrilla fighter and anti-aircraft missile expert who heads the National Civil Police — the Policia Nacional Civil, or PNC. In a wide-ranging interview with the Tribune, Cotto said the rise in gang violence didn’t occur overnight and won’t be solved quickly. The first big step, he said, is regaining territory seized over the years by the gangs, which many experts say got stronger — not weaker — during the ill-fated truce. More recently, the government has gone after the gangs’ considerable fortunes, making a big splash in July with a series of arrests and seizures of gang assets, bank accounts, cars, motels and other businesses authorities said were gang fronts. The bust put the gangs' business diversification and resourcefulness on national display. Among the arrests: gang member-turned-ordained evangelical pastor Marvin Ramos Quintanilla, who authorities say was using his religious credentials to coordinate illicit activities with imprisoned MS-13 leaders. In the Tribune interview, Cotto said young gang members, most mired in the same poverty gripping the masses, need to ask themselves why their leaders “are living so well.” Longer term, he said if the country’s leaders can’t improve the conditions of ordinary Salvadorans, all the steps taken by law enforcement won’t suffice to guarantee their safety. Central Americans who can’t wait for the country to repair itself are choosing to migrate to the United States in droves. Those who make it though Mexico and into the United States are generally aware that they have an excellent chance of remaining in the country for the foreseeable future, particularly if they are minors or traveling as a family. In large part, that’s because the backlog in U.S. immigration courts — which this summer exceeded half a million cases for the first time ever — is causing delays that experts say will postpone deportation proceedings for years. In the meantime, they are living in the shadows with the rest of the millions of undocumented immigrants in the United States, often with other family members who were already here. Jessica Vaughan, director of policy studies at the Center for Immigration Studies, which advocates for immigration restrictions, blames this "pull factor" of lenient U.S. policies more than the conditions migrants face back home. They come, she said, primarily because they know that they will be allowed to stay. She said the government could use tools such as expedited removal, which would return them home quickly and reduce the incentive to pay huge sums to smugglers. "If we changed the policies, we could reduce the flow, and that would alleviate the impact on the communities that have been absorbing them," Vaughan said. "This is not the traditional model of immigration, and it has huge implications for the communities where they're settling." More than 200,000 unaccompanied children have been apprehended on the southern border since a migration surge began in 2012, in some cases stretching the capacity of schools to provide needed education and social services. Houston in particular has seen a leap in enrollment from Northern Triangle natives, many of them teenagers with special linguistic and emotional needs, officials there say. Angela Valenzuela, director of the Texas Center for Education Policy at the University of Texas at Austin, said the child migrants have proven to be “unbelievably adept” considering what they’ve gone through, but still need a lot of extra help both in the classroom and outside of it. Increasing apprehensions in the last several months demonstrate the limits of trying to halt the flow with more boots on the ground — both in the United States and Mexico. Under pressure from Washington at the height of a 2014 surge of children fleeing Central America, Mexico launched its Plan Frontera Sur — Southern Border Plan — to catch and deport migrants using its territory as a transit point to the United States. But a recent report from Rice University's Baker Institute found that the Mexican government was spending less than originally advertised on the crackdown. The effort did accomplish one thing, according to the study: It has "made the journey through Mexico more perilous for migrants because it has forced them to seek alternative routes, many of which are much more dangerous to traverse." It has also caused smuggling prices to rise by about $2,000 a head, according to a 2015 progress report on the Mexican crackdown by the Washington Office on Latin America. A crackdown at the U.S. border isn't keeping people out, either. At a time when the United States is spending an estimated $18 billion a year on border security, U.S. Rep. Henry Cuellar, D-Laredo, told the Tribune that policy makers should pay attention to the new migration trends and recognize that an “enforcement only” mentality is both expensive and ineffective. Cuellar has successfully fought for more foreign aid for the region, in part to give Central Americans opportunities at home so they won’t have to leave. And in a recent interview, he questioned the wisdom of sending hundreds of state Department of Public Safety troopers — part of an $800 million state border security package that could grow to $1 billion in the next two-year state budget — to the Texas-Mexico border. Reporters Julian Aguilar, Alexa Ura and Annie Daniel contributed to this report.